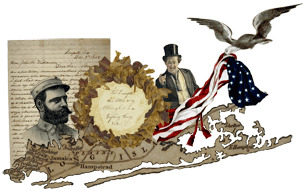 The Cedar Swamp Historical Society was founded during the bicentennial year of the United States Declaration of Independence with the mission to research and preserve the national history and heritage of the 17th century settlement of Cedar Swamp, Long Island territory east of Hempstead Harbor. In 2000, the Society's archival collection was donated to Long Island University where it remains housed in the Special Collections and Rare Books Department at the B. Davis Schwartz Memorial Library on the C. W. Post campus. The collection contains materials that extend its research possibilities far beyond the goal of the Society's original mission statement. Long Island University's Cedar Swamp Historical Society collection includes not only significant artifacts relating to the early settlers and important families of Long Island, but also a variety of paper-based materials that document Quaker history, the development of the Long Island Rail Road and the expansion and population growth of Long Island as we know it today. The rarest portion of this collection is comprised of original items of national significance from the Revolutionary and Civil War periods including maps, letters, deeds, and ephemera considered valuable complimentary materials that will impact a greater body of knowledge when made accessible to the research community at large.